Stunning Neel-e-Kirman design 100% Handmade in Kashmir Silk on Cotton rug. Vibrant colors like Soothing Brown and Tinges of Sky Blue are dominant in this rug. Very intricately woven, it has taken 4 months to weave this rug by our skilled artisans. - Gorgeous piece of art with floral pattern. - Design is Neel Kirman with intricate design and great craftsmanship. 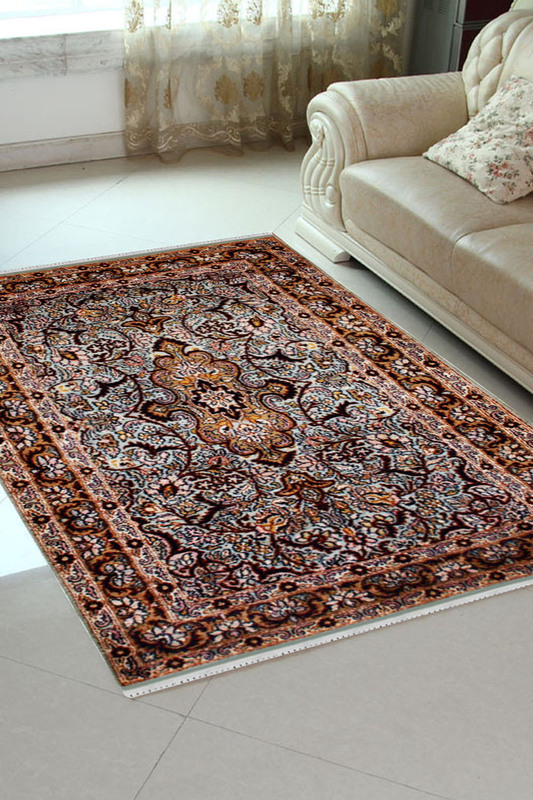 - This rug is Handmade in a cotton base and has pure Kashmir Silk on top. - Number of Knots in this rug are 324 knots per square inch. - It has a thin layered Chocolate border with an intricately woven design. - The design is originated from a town in Persia called Kirman. - It has taken 4 months to weave this rug. - Primary colors are Soothing Brown, Caramel, and tinges of Sky Blue. - Ideal as a Wall Hanging or a Coffee Table Rug.